Ballpark Basics: A classic ballpark for a classic team. Ballpark Breakdown: Red. 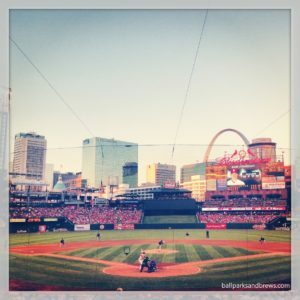 That is the only word to describe Busch Stadium. The seats are red. The crowd is draped in red. The ballpark itself is wrapped in red brick. The neon and ads are almost always red. 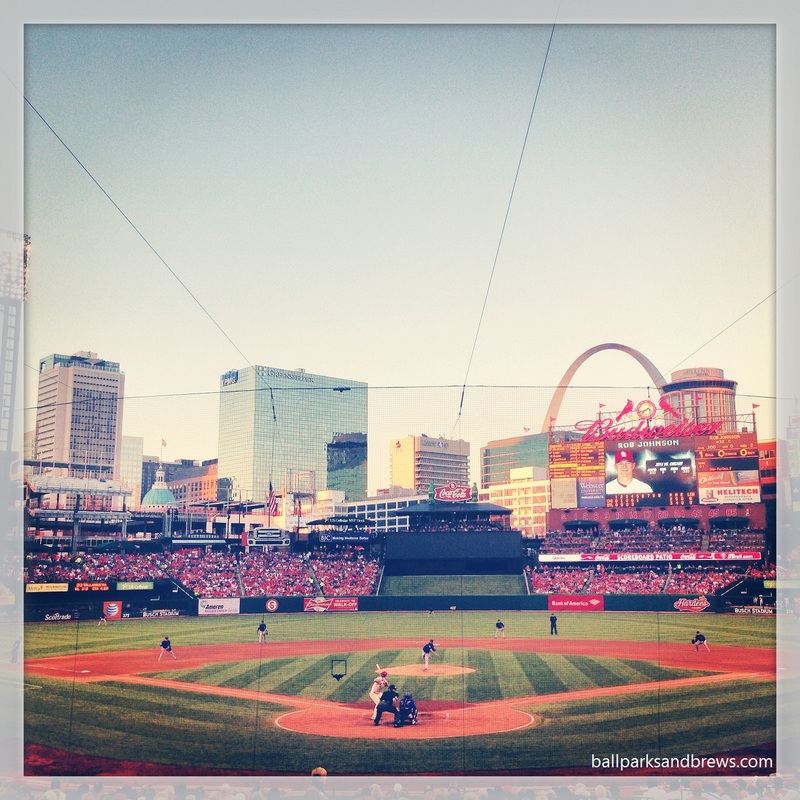 When you take in a game at Busch Stadium you know where you are. Cardinal fans are often regarded as some of the best in the business and the team is often regarded as one of the best in baseball (Gillian, the Cubs fan, would beg to differ). The game we attended definitely had an electric feel for just being a mid-summer series. However, it was a game against the Cubs and this rivalry will always add to the excitement. With a team that has the sort of history that the Cardinals do they certainly don’t shy away from it. From the statues out front to the Cardinals Hall of Fame to the multitude of retired numbers Cardinal Nation fully embraces it past. 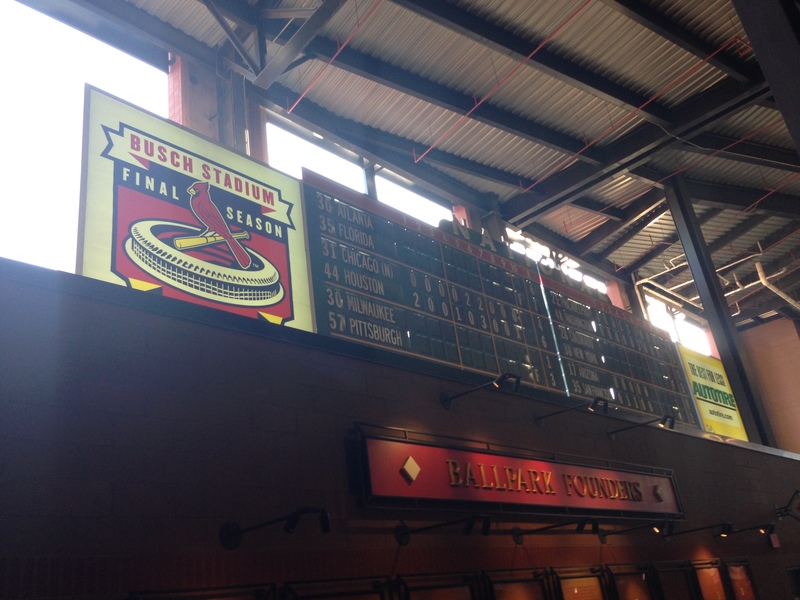 Probably the coolest piece of Cardinals history is the complete scoreboards that were removed from the previous stadium, complete with the final scores from all the games played on that date. These can be found in the lower concourse. The area around the ballpark has changed recently after the Ballpark Village opened for Opening Day in 2014 and sits on the site of the the old Busch Stadium. It includes the aforementioned Cardinals Hall of Fame, a Cardinals shop as well as some chain restaurants and bars. Best Spot for Local Beer: Considering the stadium is named after one of the major macro-brews it is good to see lots of local and microbrews throughout Busch. Hometown favorite Schlafly is fairly easy to find (Sidenote: Schlafly really needs to update this shirt for the new ballpark). The best spot to find craft beer is on the lower concourse in Section 135. Here you will find a craft beer bar with 20 taps including local favorites Schlafly, Urban Chestnut, and O’Fallon. 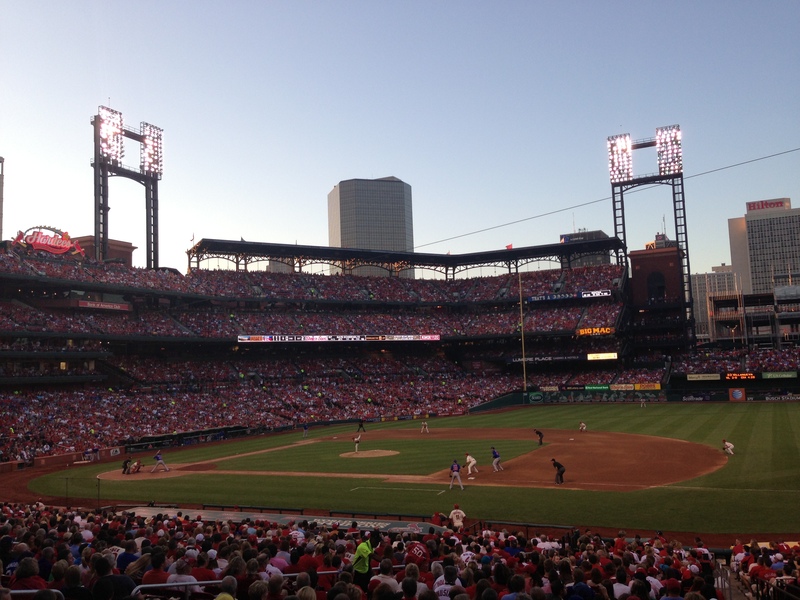 Overall, Busch Stadium is a great park to catch a game. It doesn’t have the history of a Wrigley or Fenway. It doesn’t have the classic feel of Camden Yards but the organization and the fans make this a special place to watch a game. 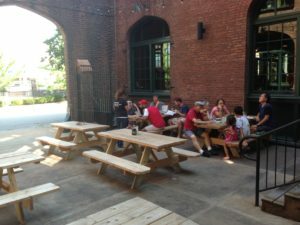 Beer basics: Two locations, one of which saved the day! 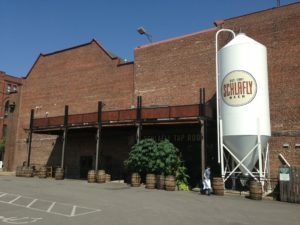 Schlafly is a fairly well known brewery that is doing a great job holding on to the craft beer feel while achieving such success. 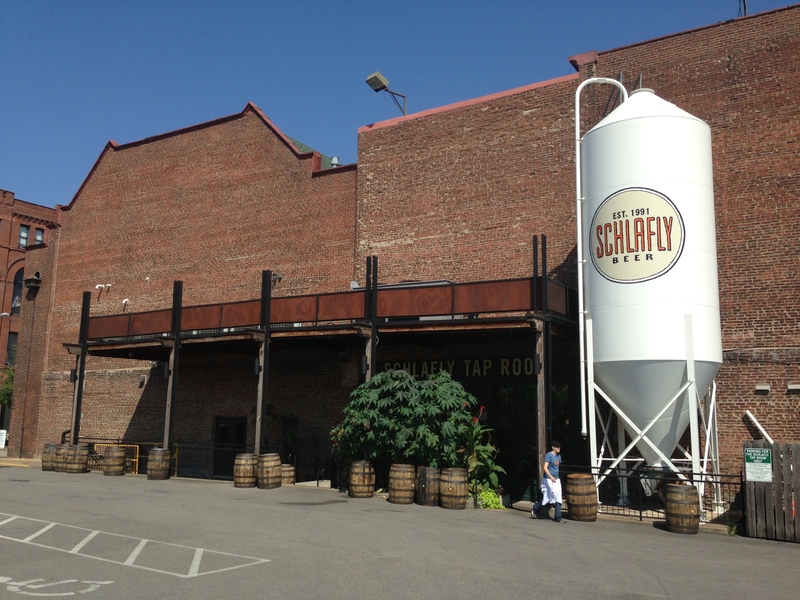 Schlafly can also claim to be “hip before it was cool” as Tom Schlafly’s Inc. opened back in 1989 – well before the craft beer craze – and there’s been success and growth ever since with the taproom opening in 1991, restaurants soon following in 1993 and 12oz bottling by 1996 and finally a second location opening doors in 2003. By 2009 they were brewing over 30,000 barrels a year just to keep up with demand. We visited the original one in St. Louis, with our up-for-anything guest reviewers Emily and Tony. The building is old with large windows, and loft style black matte venting. Divided into two, the restaurant side of the building has hardwood floors and lots of tables, the bar side has a tiled floor, pool tables and high top bar seating. Food is good and available on either the bar or restaurant side, the atmosphere is fun, there were large parties playing drinking games in one part of the restaurant, friends having a midday chat, and families having lunch all at the same time. It’s a great place to hang out (but it could use a few more bathrooms). Cream Ale (5.0 ABV/15 IBU) White grape juice color that’s very carbonated and slightly tart. A light, crisp and flavorful beer that’s cold conditioned and uniquely, 20% corn. Oktoberfest (5.5 ABV/25 IBU) Orangey-lager brown color that’s cloudy and lacing that sticks to the sides of the glass. Not a lot of aroma but a lot of flavor. Schlafly’s Oktoberfest is tartly bitter and despite the low IBU rating, thoroughly hopped throughout and even has lingering hoppiness in the aftertaste. Although usually a favorite style, it wasn’t our favorite that day; as Tony put it “it dries out my mouth”. Dortmunder (5.8 ABV/ 25 IBU) Schlafly’s Dortmunder pours light and crisp, but isn’t as hoppy as some we’ve tried. The palate is more of a malt/hop blend where one doesn’t stand out more than the other but combine to give this beer a very strong flavor. Summer Ale (4.5 ABV/ 21 IBU) – The color is similar to the cream ale, but the taste is much lighter. The aroma is a kind of wet wheat smell, and the Summer has almost no palate, just a slight malt at the finish with a watery aftertaste. Pumpkin (8.0 ABV/ 16 IBU) – Schlafly’s pumpkin is one of their more popular beers, that pours a pretty amber, rust color and smells like pumpkin at first, and then warmer with fresh cinnamon and nutmeg. It’s just lightly carbonated, creamy and pumpkin fall spicy. Bourbon Barrel Ale (7.0 ABV/ 30 IBU) – The bourbon is definitely a main part of the bouquet in this sienna colored ale; but isn’t overpowering and actually sticks mostly to the aftertaste, where you get the warm liquor flavor in your throat. Despite a slightly watery start, the flavor is strong and even slightly sweet since it’s not a stout to mask the bourbon. Oatmeal Stout (6.0 ABV/ 40 IBU) – A pretty beer that is dark brown with ruby tones and like the Pumpkin, one of the most popular Schlafly brews. Here’s why; it smells like smoke and coffee, tastes roasted. It’s smooth and even, has a slightly nutty finish and is the best of the stouts they serve. Vanilla Imperial Stout (10.5 ABV/ 50 IBU) – The Vanilla Imperial is similar in color to the dark coffee color of the Oatmeal stout, but without the ruby notes. It smells strong (imperial) and like vanilla extract, the taste is the same but in reverse with not much up front, then the vanilla hitting your tongue first and the sweet, strong imperial flavor following. It finishes bitter like the burn of a shot or like drinking straight extract. Oud Bruin (5.5 ABV/ 10 IBU) – This unusual beer is an unfiltered, ruddy color that smells sour. It tastes like old wine that’s been sitting around and recooled. Not a popular choice among anyone at our table.